There was a hive of activity at Flying Gloat Cellars in Lompoc on Saturday as the wine shared the spotlight with bees in honor of National Honey Bee Day. The winery hosted a public demonstration and educational event that featured honey sampling and tasting of mead, a wine-like alcohol made from honey. Beekeepers were on hand with information on bees, and an observational hive that allowed visitors a peek at bees busy at work. 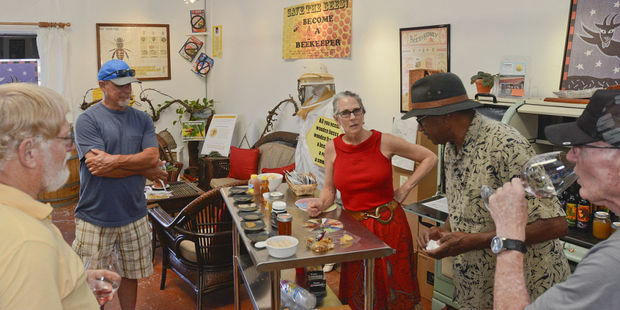 Lompoc bee keeper Archie Miller pointed out to curious onlookers the various parts of the hive and what they are used for—not only by bees but also by people. Everything from the honey to the waxy combs called bee’s bread, to a sticky glue-like substance called propolis or bee’s glue can be used for various purposes. 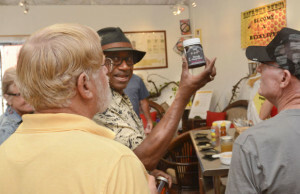 “Some people feel the whole beehive is a medicine cabinet,” said beekeeper Archie Miller. Chris Jeffries of Santa Barbara said she came out because of the event and because she has an interest in beekeeping. She said she grew up exploring the property that belonged to her aunt, who married a bee keeper. “That’s where I first got to bite into a honeycomb. It’s a sensation you’ll never forget. I have fond memories of that,” she said. 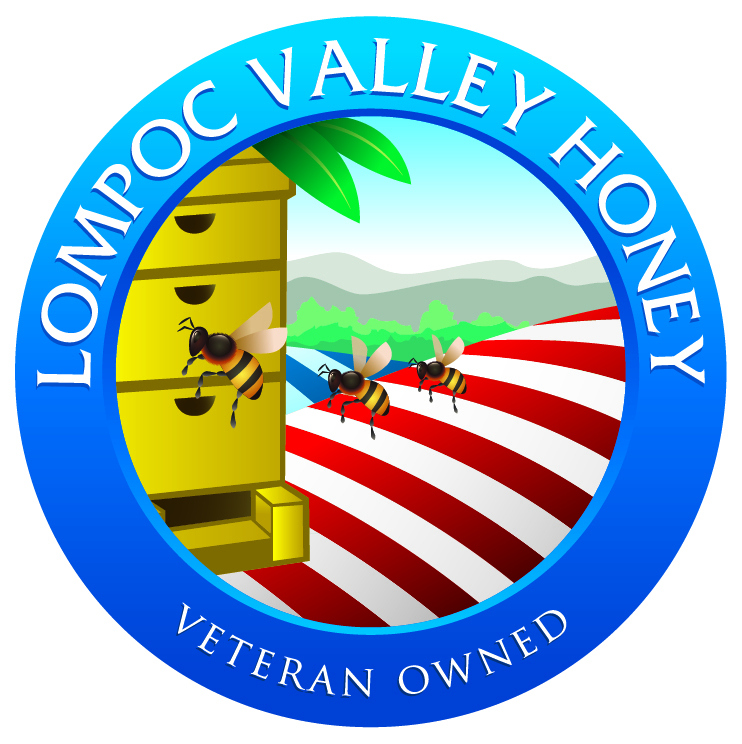 Jim Rice, president of the Lompoc Valley BeeKeepers Association said he gets requests all the time from people like Jeffries who are interested in backyard beekeeping but that many localities have restrictions on backyard bee keeping. He said recognizing National Honey Bee Day was important in helping people recognize the plight of the honeybee whose colonies are in decline from toxins and even a short and early bloom season because of the drought. Increasing backyard beekeeping is one way to help bee colonies. “Here in Lompoc we’d like to see the ordinance changed that allows people to have bees in their backyard. So the more people in the local community that get on board with that the more pressure we can apply to our local officials to get that ordinance changed,” Rice said. Kate Griffith, owner of Flying Goat Cellars said she and her husband have been beekeepers for two to three years and for the last year they have worked on a project making mead with Buellton’s Steve Ferri. They also produce their own local, unfiltered honey under the label Hush Honey. “We would like to enhance or increase people’s awareness of the bees and the plight of the bees and to get people interested in backyard beekeeping,” Griffith said. Miller said there are some tasty advantages to having backyard bees. “Whatever flowers they work on, that gives the honey its taste. The honey that we get from the backyard it’s unique because they go into so many different flowers. I call it backyard gold because of all the different floral sources,” he said. Miller said there are plenty of things people can do to help bees, including eliminate the use of insecticides, avoid using seeds coated with systemic insecticides, create natural habitats and plant bee-friendly flowers.